The TARGAS-1 console is compact, lightweight (2.1 kg) and is packaged in a rugged, aluminum enclosure with a shock absorbing polyurethane base making it extremely robust and reliable under harsh environmental conditions. It incorporates two non-dispersive infrared gas analyzers for CO2 and H2O ensuring accurate measurement and control of both CO2 and H2O. 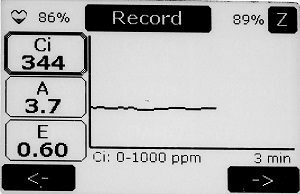 An internal air supply unit provides accurately controlled reference air to the leaf cuvette and another pump draws the sample (analysis) air to the gas analyzer. 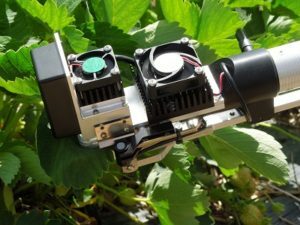 Both pumps are user controlled and accuracy is ensured by two internal electronic flow sensors. The TARGAS-1 is perfectly suited for applications that demand portability and a high degree of accuracy and control with minimal maintenance. The design of the instrument ensures an inherent calibration stability that has been confirmed by many years of experience in gas analysis technology. The TARGAS-1 gas analyzers should not require frequent recalibration, although we do recommend periodic checks to confirm system integrity. 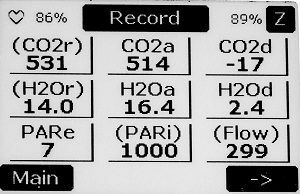 Both the CO2 and H2O gas analyzers employ a non-dispersive, infrared measurement technique, coupled with microprocessor-based signal processing, to achieve excellent stability and specificity to CO2 and H2O. 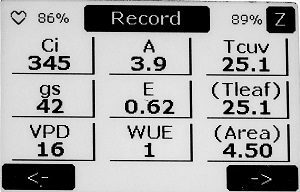 Our innovative “Auto-Zero” technology ensures fast warm up, long term stability, accuracy and analyzer calibration. 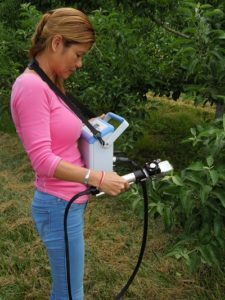 It also minimizes the effects on span gas sensitivity, sample cell contamination, IR source aging, changes in detector sensitivity and electronics. All electrical and gas connections, USB interface, power and desiccants are conveniently located on the console rear panel. The TARGAS-1 is supplied with a very efficient, powerful and rechargeable Li-ion battery capable of providing operation in the field for up to 10 hours. The instrument can also be used with an AC power supply (included) for continuous operation from the mains in the laboratory. Data storage is virtually unlimited. Data is stored on a USB flash drive (memory stick) for safe storage and easy transfer of data to your PC. An Innovative, large, touch display (EPD) features simple and intuitive system navigation and it offers excellent viewing under high sunlight. 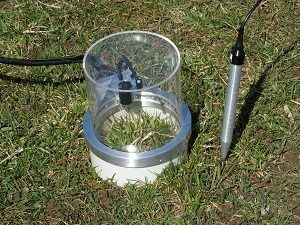 The PLC Leaf Cuvette is extremely versatile and light weight (0.7 kg) making it ideal for measurement on a wide variety of vegetation including broad leaves, narrow leaves, grasses and small needle conifers. 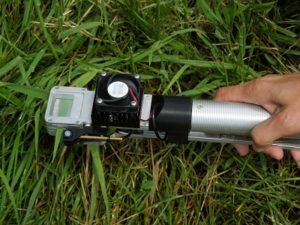 It includes sensors for measurement of air temperature and PAR. All leaf cuvette materials are carefully selected to minimize influences such as infrared radiation, water sorption, CO2 effects and leaks. The leaf gaskets provide an air-tight seal without causing damage to vegetation. An optional, low power LED based light unit is available for light control if required. It is a useful option for light response curves and to simply have on those cloudy days. The unit clips onto the head of the PLC5 Leaf Cuvette and it can easily be removed for measurement under ambient conditions. 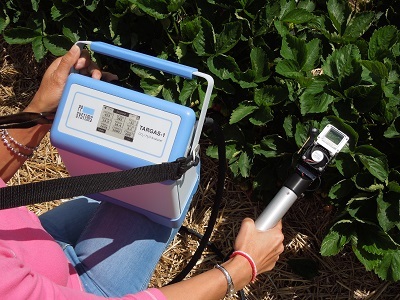 Our SRC-2 Soil Respiration Chamber can be used with the TARGAS-1 for easy, accurate and rapid measurement of soil CO2 efflux. 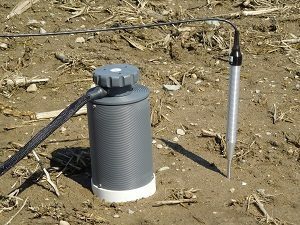 The chamber is constructed out of rugged PVC with stainless steel ring (for sealing) and it includes an internal fan for flushing and mixing the air and an air temperature sensor. Collars (optional) are also available for use with the SRC-2 chamber. Our CPY-5 Canopy Assimilation Chamber can be used with the TARGAS-1 for easy, accurate and rapid measurement of net canopy CO2 flux on low lying vegetation. The chamber is transparent and it includes a fan for flushing and mixing the air and sensors for measurement of air temperature and PAR. Collars (optional) are also available for use with the CPY-5 chamber.